“Having read – and enjoyed – The Way of Spirit, I was eager to dive into this book. It did not disappoint. Rose/Joanne teaches us how to move through grief in ways that have previously gone unaddressed by society. What if life knows better than you do what you need? And what if everything—even loss—could contribute to your happiness? Wouldn’t that make the large and small losses you experience daily easier to take, and life itself a friend rather than an enemy? Yes it would. The problem in not knowing how to process loss is what keeps millions of people suffering with anxiety, addiction, despair, and depression. 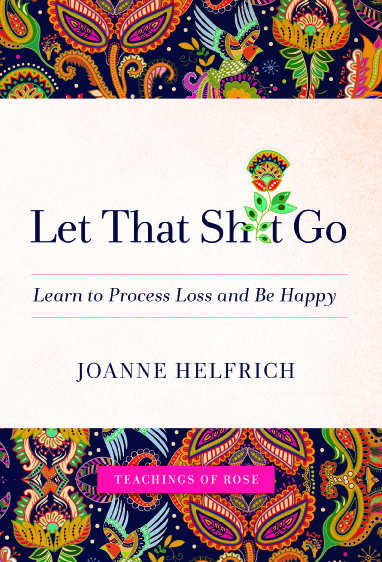 But you don’t have to, because this little book will help free you from what makes you unhappy so you can live with joy and purpose. The inspiring, often humorous wisdom and practices will help you feel better right away, clear your harmful habits of thinking, release guilt and regret, and find yourself in love with life again.